First, we must distinguish between a civic federal offense and a federal misdemeanor. To be in this country without permission, or to stay after a visa expires, is a violation of federal civil immigration law, whereas entering this country without permission is a federal misdemeanor. Local and state police do not have the authority to enforce federal civil offenses: this means that they cannot arrest anyone for a civil federal violation. However, if they so choose, they can detain a person for a federal civil offense, if that person is already in police custody for another reason. But this action can have consequences. Here, a constitutional question is applicable: the fourth amendment, which protects against arbitrary investigations and apprehensions. This was established in the case of Miranda-Olivares versus Clackamas County, when the Supreme Court ruled that the county sheriff did not have probable cause to detain her simply because she did not have papers. The sister of Miranda-Olivares tried to pay her bail, only to find that she could not take her home from prison because ICE had issued a detainer on her. For following the internal policies of the police department and, in doing so, having complied with ICE’s request and detained her without granting her right to post bail, the county was required to compensate Miranda-Olivares with $30,000 as well as pay for all of her legal fees. I wonder how many immigrants in our Dutchess, Ulster, Orange, Columbia, and Sullivan counties have faced similar situations, and want to fight for their rights in court. This Lexipol seminar is highly informative and is considered a reliable source for police departments all over the country, including in our Hudson Valley. 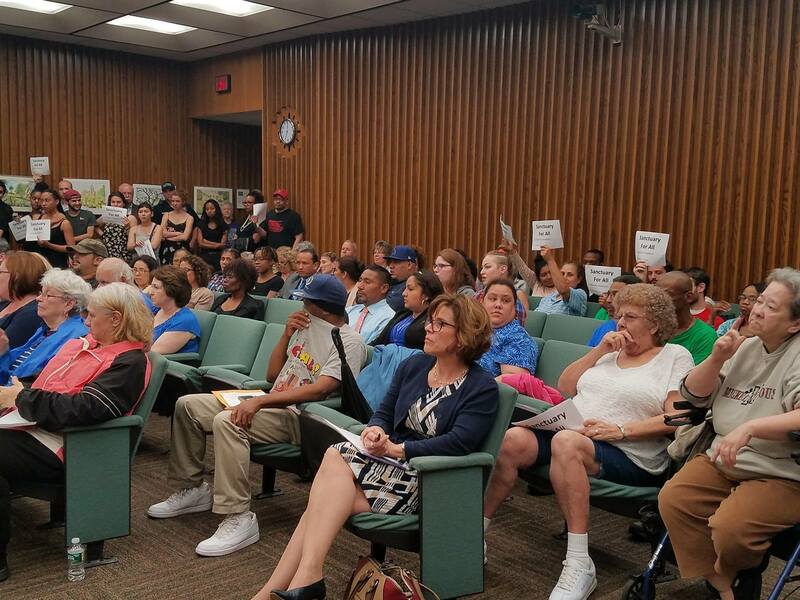 This became evident on Monday June 5, at the Poughkeepsie City Council meeting, when the vote to declare the city a sanctuary was postponed to Monday, June 19 at the request of the Chief of Police, Thomas Pape. On June 5, Pape said that he agreed with the idea of the resolution, sponsored by councilors Young and Cherry, but he wanted to be more certain, so he recommended that the vote take place at the following meeting, June 19, because first he wanted to attend a webinar that would answer his questions. The webinar, which took place on June 13, was organized by Lexipol and was led by the Eureka, California, Chief of Police, whose county has adopted sanctuary-style regulations. Lexipol, according to Pape, is a risk-mitigation company that writes and adapts policy and procedures for police departments all over the country, based in federal and state law. Those interested in seeing the complete webinar can access it here. Two weeks later, on Monday, June 19, Pape went before the council again and said yes, that this time he would recommend voting in favor of the resolution. The good news (if you have not already heard) is that, by a unanimous vote, the eight councilors of the City of Poughkeepsie (including the only Republican in the group) voted in favor of the sanctuary city resolution. Yes, we could! The people, united, will never be defeated. (many Hispanic people came to support the vote, incidentally). But it doesn’t end here. The place where the most families are separated is in actually in county jails. As I mentioned, the decision to cooperate with an ICE detainer that does not have a judicial warrant attached depends on the internal policy of every police department. Internal policy is not law, it is something that police chiefs and sheriffs themselves can modify or put in writing at any time, or when a local legislative government requires it (as was the case in Poughkeepsie). As we know, deportations of non-criminal immigrants have increased more than 40% this year, according to statistics released by ICE. Cooperation between police departments and immigration officials, when it is not absolutely necessary, is causing considerable harm: to families, to businesses, to the agriculture and tourism industries (strong economies of our area) and irreparable damage to a generation of young Americans who are growing up full of distrust. Now is the time for every branch of the county governments, including law enforcement, to work harder to show us that they truly protect all of their residents.